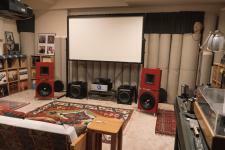 I ended up having six ½ hour listening sessions in my main room. Since it only could accommodate five full-sized humans at one time I managed to acquaint almost 30 brave souls with my system. As I explained during the sessions, this experience was an example of "musical chairs" because after each selection listeners had to change listening positions. The reason for the position changing is simple - my system was set-up for optimal listening by one person - that seat is a 10, the two seats on either side of the prime position are only a 6 on that same scale. The two seats behind the couch were 8s. Who says you can't get some exercise while listening to music? One of my issues with demos at audio shows is that whatever seat you have for the demo is the seat you have for the whole demo - if it was a good seat, fine. But if it was one of the bad seats near a side wall or the back where the midbass is usually overblown, your opinion of the system will be far different from the folks in the good seats. At least in my demo everyone got to experience both the good and the less good seats. Since no planned demo goes quite according to plan, there were several hiccups along the way. The first potential problem was caused by one of my two JL Fathom F-112 subwoofers. I acquired both in 1998. Last year one of the two went silent, but after a trip back to the factory (I detailed the experience here), it came back good as new. At the end of January, the other subwoofer gave me the silent treatment so it, too, had to return to JL for repair and refurbishment. 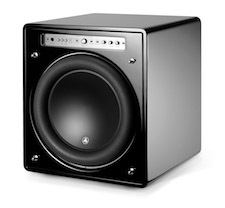 The subwoofer arrived back home on Friday Feb 23, one day before the demo. 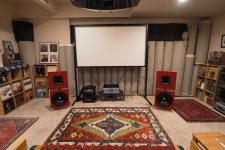 Since I was lazy and forgot to photograph my settings before I sent the sub out for repair, I spent several hours on Friday evening calibrating and re-integrating the subwoofers with the Spatial X-2 loudspeakers. The final result was well worth the effort. I got better integration and more midbass energy output after the new set-up was completed than I had before the subwoofer got its speedy repair. The second issue I came up against was time. I originally selected way more than 30 minutes worth of demo music. Two thirds of the way through the first demo I realized that not only would I not have time for 30 minutes of music in a 30-minute demo, I didn't even have time for 20 minutes! After getting five folks downstairs and seated and my opening introduction to the system, listing what was in the signal chain and what we would be listening to, I was lucky to fit in even 20 minutes of music. Most of the demos were seven-cuts worth, which was three cuts less than ideal. With ten cuts each listener would have had each listening position twice. As is, some folks only had one round in the best listening position. I felt less than jubilant about that.